A range of Single and Double door cabinets ideally suited to house and protect instrumentation, control panels, pumps and any smaller items of equipment, providing security to equipment on unmanned sites. The cabinets are supplied across all market sectors including the Utilities, Local Authorities, Rail and the MOD. Units are manufactured from 2mm folded pre-galvanized sheet steel and are fitted with stainless steel door furniture as standard. Standard colours are BS 4800 14 C 39 Green or 10 A 07 Grey, alternative colours are available on request. The full range of cabinets are available in Steel, standard construction is 2mm pre galvanised sheet and painted to BS or Ral range. 3mm and 5mm steel, Stainless Steel, Aluminium are available. The steel kiosk range is offered in a full range of powder coated finishes. Meter Cabinet). 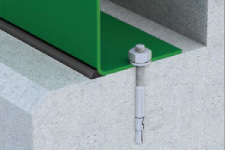 Standard fixing is through reinforced internal flanges by rawl bolts onto prepared concrete bases. Alternatively, most units can be wall mounted.